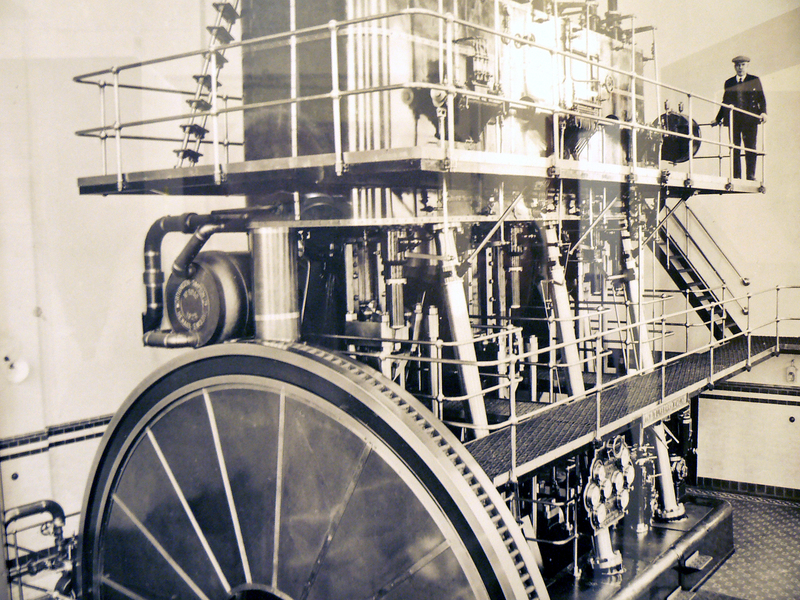 The "Burberry Engine" at Patcham Pumping Station, Brighton. 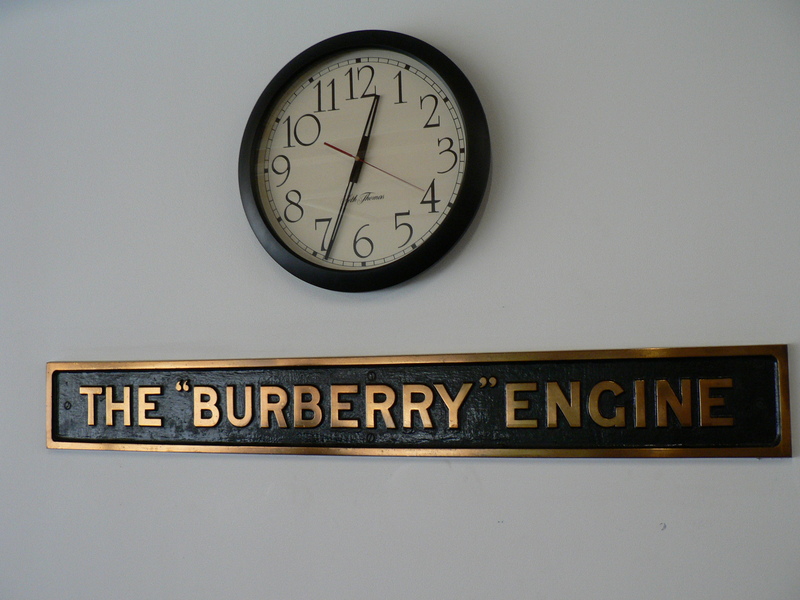 The Burberry Engine sign in the Burberry Club, Southern Water, Lewes Road, Brighton. Jonathan Burberry was born in Rusper, Sussex in the last quarter of 1859. (Horsham Reg District 2b 254). He was one of six children born to Jonathan Burberry (of Capel, Surrey), a butcher and grocer, and Martha (nee Snelling) of Horne, Surrey who married on 13 June 1854 at Horley, Surrey. 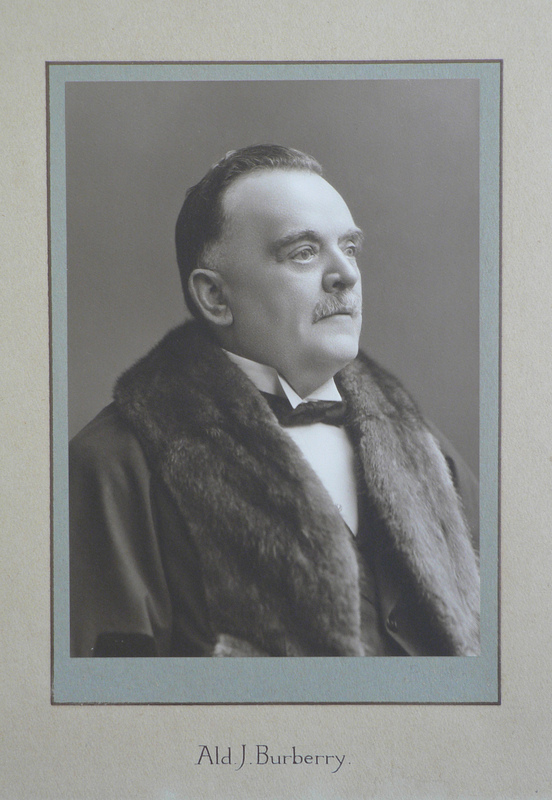 According to his grandson Herbert Leonard Hobden in 2006, Jonathan junior visited Brighton, and liked it so much that he decided to move down from Surrey. Jonathan was also a butcher by trade. 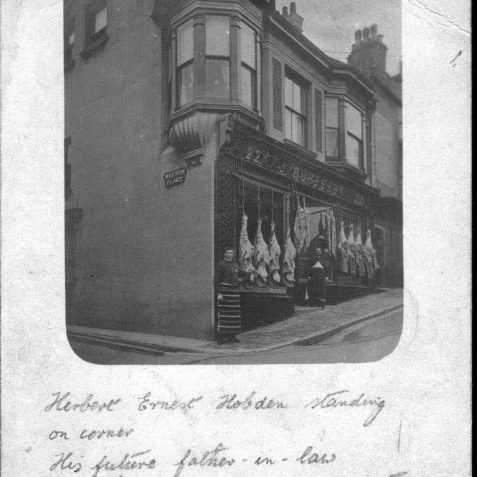 He ran his business from a double-fronted, south-facing shop at Nos 22/23 Carlton Hill, Brighton, on the corner of Nelson Place. It had a fancy turret window at the front (south west) corner of the building, on the first floor, which projected over the pavement below. 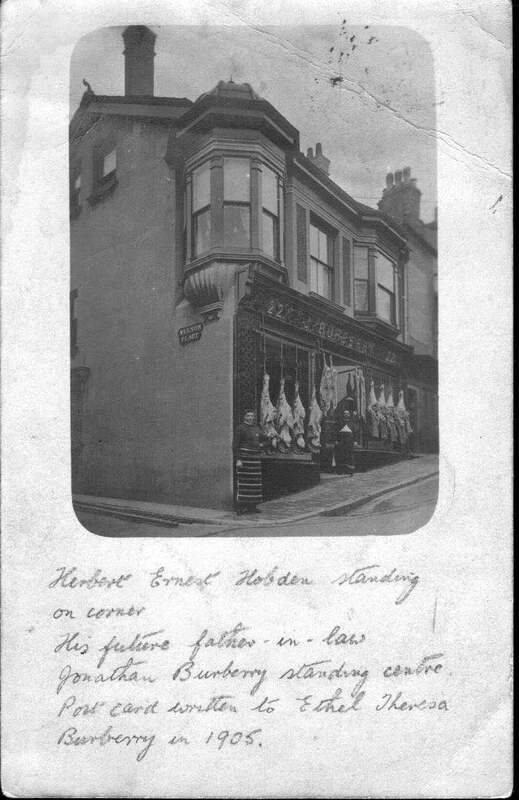 His premises were described in a Brighton guide of 1911 as “commodious and scrupulously clean… fulfilling the most acceptable ideals of a first-class meat business”. The area was cleared in the 1930’s and the Kingswood flats built on the site of Jonathan’s shop. He married his first wife, Theresa Trent, (born in Winfrith Newburgh, Dorset on 28 March 1852) at the parish church in Caterham, Surrey on 23 September 1878. She had already left Winfrith and had been working as a cook for Reilly E. Bartley, a corn merchant, at 88 Elsham Road, Kensington at the time of the 1871 Census. The census records show that his mother had followed him to Brighton, almost certainly after the death of Jonathan’s father in Surrey in 1882, as the 1891 Census shows her at 124 Albion Hill, Brighton (now Martha Humphrey, a butcher (employer), widowed again) along with Jonathan’s brother George, aged 19, a butcher (employee). Jonathan’s older brother William was living a few streets away at 45, Southover Street, Brighton (Source: Brighton Census 1891 (RG12/806/F.95/P.27/Sch.193) with his wife Lucy and three sons and daughters. William was also a butcher (not an employer), and may have been working for his mother. Later that year, on 3 August 1891, at the parish church of St Peter’s, Brighton, Jonathan married Emma Hamilton, who was born in Upperton near Petworth, Sussex in the June quarter of 1849. It is not yet clear whether Jonathan and Emma raised any children of their own. The 1901 Census for Brighton shows the couple at 22 Carlton Hill, Brighton (Ref: RG13/922 F.103/P.47). (Frederick Wells, a greengrocer, is living next door with his family at No 23.) At this time, brother William Burberry and his family were still living at 45 Southover Street, Brighton. 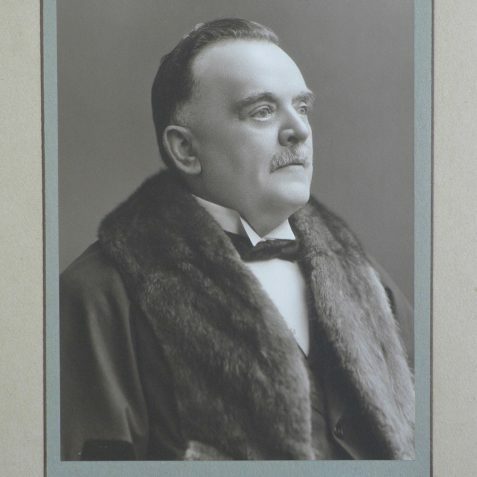 Jonathan served his local St John’s Ward as a Brighton Town Councillor from 2 November 1896 (when he was already a prosperous young butcher with a thriving business in Carlton Hill), and an Alderman from 29 April 1915. The Kellys Directories of Brighton for 1918 and 1923 show him to be living at Hamilton House, 22 Carlton Hill. Even in those days St John’s was one of the “stormy” wards at election times, and he had six strenuous but successful fights to retain his seat. He served on the Watch, Health, and Pavilion Committees and chaired several, including the Waterworks Committee. 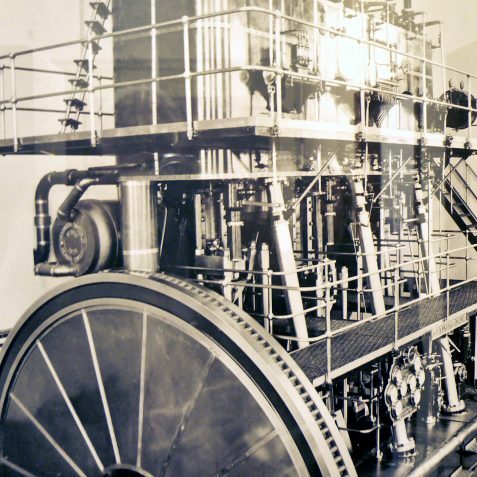 It is thought that the Burberry Engine in the specially built Burberry House at Patcham Pumping Station, was named after him. Great grandson Alan Hobden was shown a photograph of this engine in February 2006 by a Brighton Waterworks employee, Darryl Paddick. It was built in 1928 by Worthington Simpson Ltd of Newark and London, and bore the number 5045. The plans for the pumping station were submitted in 1927, (a year in which Jonathan chaired the Waterworks Committee), and the building works and installation of the engine were carried out in the following year. At the time of his third marriage, to Louie Thomas (nee Snelling) on 11 May 1931 at Brighton Registry Office, Jonathan and Louie were both stated to be living at No 78 Beaconsfield Villas, Brighton. Jonathan’s stepson, Thomas Henry Funnell and his wife Kate were present that day, and appear in a wedding party photograph taken outside 15A Stanford Avenue, Brighton (which is noted as Jonathan’s address in the Kellys Directories for 1935 and 1936, and the Pikes Directory for 1939/40). The witnesses were Ethel Theresa Hobden (his daughter) and her husband Herbert Ernest Hobden. It almost goes without saying that Herbert was a butcher! He had met Ethel whilst working for Jonathan in the Carlton Hill shop, and lived at 27 Southampton Street, Brighton with his family during that time. Jonathan later moved a few doors away to No 8 Beaconsfield Villas, Brighton, where he died after a prolonged illness on 3 April 1943, at the age of 83. He had outlived all three of his wives. His death certificate shows that he died of cerebral thrombosis, bronchitis and influenza, (informant E T Hobden, dau, 30 Berriedale Avenue, Hove.) Most of the members and officials of the Corporation (including the Mayor and Mayoress Dutton Briant) attended the funeral service, which was held at St Peter’s Church, Brighton on Wednesday 7 April. Jonathan was buried later that day in Brighton’s Extra-Mural Cemetery, (Grave No. 45056). 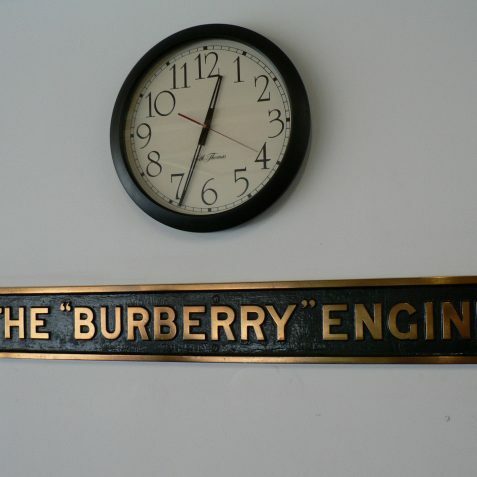 Footnote: In February 2006, great-grandson Alan Hobden discovered that the Sports & Social Club of Southern Water in Lewes Road at Falmer, Brighton was still called “The Burberry Club”, and the original “The Burberry Engine” sign is displayed in the clubroom on the wall below the clock. This was clearly rescued when the engine itself was dismantled at Patcham Pumping Station. Jonathan Burberry was my Great Grandfather. I learned the history of the Brighton ‘Burberry’ Pump from my Father Percy Walter. I also found that the engine nameplate was located at the (then) restaurant at Southern Water Offices Falmer. In the mid 1980s I had provided training for Southern Water and the presentations were held at Falmer. I inadvertantly took a wrong turn into the restaurant and found the plate. Really great to see it after all those years. Glad to hear it is still in safe hands.